Welcome to the third entry in my series of postal experiences in eastern PA.
Out of curiosity I checked in on the Elmhurst post office yesterday, the day after it closed. All signage was still there (including a sign down the road that points people to the United States Postal Service); the only change was that the mail collection bin was covered with a large garbage bag. For the first time, on this trip, I actively sought out post office former sites [see Postal Mortem: Minisink Hills, PA for my first post about this]. I was somewhat curious what would happen to the building once the post office had closed. Additionally many of these locations, to my knowledge, had not been documented in the past! My finding is that, in this area, each storefront location that had once housed a post office is still vacant, regardless of how long ago the post office closed (a few months to several years). This includes Minisink Hills and the three locations featured in this post. It's not a conclusive finding since I didn't visit the DPO of South Sterling, PA and a couple of others in the region. But within the greater Scranton area it appears to be the case. 1. Archbald, PA: Eynon Station. Address: 343 Main Street. Date of discontinuance: ~ several years ago. 2. Scranton, PA: Old Forge Branch. Location: 133 Moosic Rd. Date of discontinuance: January 14, 2011 (a consolidation "Hit List" office). 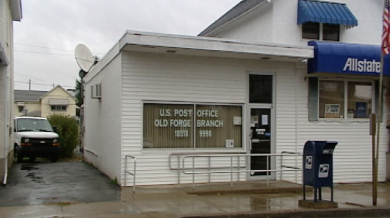 The Old Forge post office was about a mile from the Scranton, PA: Taylor Branch. I believe O.F. operations were split among Taylor and Pittston's Duryea Branch. 3. Pittston, PA: Avoca Branch. Incredibly, the primary post office signage still remains! And how beautiful it is. The building dates from the late 1800s. I believe stamps are now sold in the pharmacy next door, though there are no postal retail operations in the town. Again, note how the post office site is still vacant. USPS does not list locations of recently closed postal locations. However, in most cases the blue collection boxes remain in front of the site. I find that searching the ZIP code or city in the Payphone Project Blue Mailbox Locator tool is the most effective way of locating former offices. USPS's Locator Tool also has an option which can give you such information, but the Payphone Project search gives you more information about the box locales. (And since its information is not entirely up-to-date, it thinks many of the postal stations and branches are still open!) I'll detail a positive find from Olyphant, PA in a later entry. I tried the Project Blue Mailbox locator with the first 551** and got the locations for the 551 ZIPS as well as any areas with 551 in the addresses.